So you want to laugh? Our theater group ECTA is known to our audience as creators of serious theater – theater which makes us think, makes us to introspect and makes us a bit more engaged with our fellow members of the community. This however does not mean we don’t like to have fun. Over the years, many of our audience members have requested us to produce a full blown comedy that would cause a laugh riot in the theater. And we listened. So this year we are staging not one, but two comedies that will make you laugh like you have never laughed before – “Dance Pe Chance” and “Banijye Basate Lakshmi”. “Dance Pe Chance”, directed by Aparajita Das, is an out and out satirical comedy where we make fun of ourselves and our popular culture. The play is a parody on the craze of ‘Reality Shows’, where the lure of becoming an overnight celebrity becomes stronger than the urge to create good art. Few wannabe dancers of our community decide to participate in a dance competition to be judged by one of the biggest celebrity stars of Bollywood and Tollywood cinema. 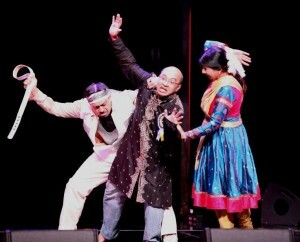 The play created a sensation at the 2012 North America Bengali Conference in Las Vegas where the entire Jersey Boys Auditorium rolled in laughter for the entire sixty minutes. Since then we have had numerous requests to stage this play in New Jersey, and finally on April 20th and 21st, the Jersey Bengalis will also have the opportunity to enjoy this fun show. 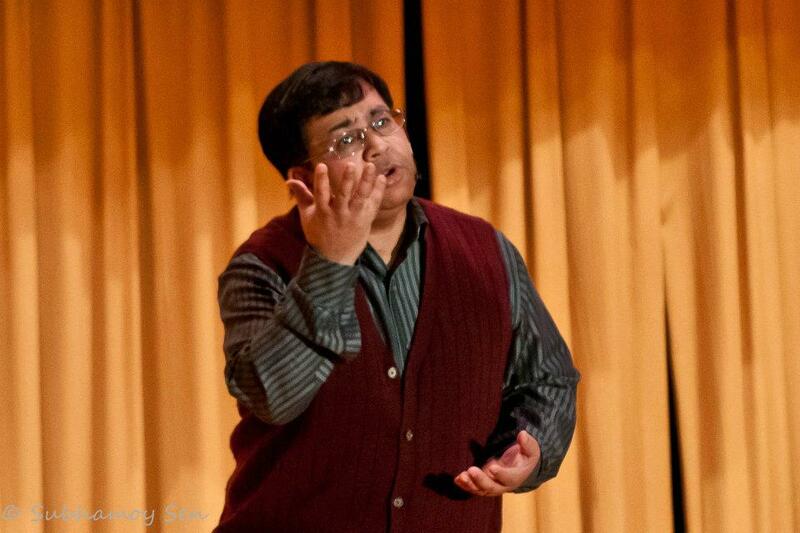 In “Banijye Basate Lakshmi”, Gagan Goswami, the famous motivational speaker examines the age old question, why Bengalis can never succeed in business. In his recently authored book, ” Ka -e- Kenabecha “, Goswami claims that to do business, a Bengali need to know only the first letter of the Bengali consonants. Today, he has been invited to talk to the audience and inspire them into doing business and build business empires. What follows is a colorful journey through the life of a Bengali entrepreneur and his search for an answer to the most important question of life – why? The play, directed by Sankar Ghoshal, was first staged at the 2012 GSCA Saraswati Puja where the speaker kept the audience spell bound for ninety long minutes through his captivating life story. He made them laugh, he made them cry, he made them think. The plays are undoubtedly comedies, but as we all know, comedies are nothing but another way, a funnier way, to look deep into ourselves and discover thruths that we could never fathom otherwise. The plays will be staged at the Edison Valley Playhouse (2196 Oak Tree Road, Edison, NJ) on Saturday April 20 at 6:00pm, and on Sunday April 21 at 4:00pm. Each day wil feature both the plays with an intermission in between. Tickets are $20.00 per person, per day. True humour, they say, reflects a person’s intelligence. Keep up the good work, as always.